Winter is the perfect time to use that fireplace or fire pit. Letting the warmth of a nice roaring fire bask over you as you sip a hot toddy or yuletide drink while inhaling the brisk winter air is invigorating, yet soothing! Don’t let you fireplace or fire pit sit idle this holiday season. Check out our video on fireplace and fire pit maintenance so you can safely enjoy the great outdoors this winter. Here are a few tips to keeping your fire burning this fall and winter. Whether you are enjoying the warmth as you listen to the crackling of the fire, sipping on your favorite beverage or toasting marshmallows with the kids, there’s nothing like relaxing in the comfort of your own backyard. The benefits of fire pits are many –they make the outdoors a year round gathering spot. The winter night sky is a beautiful thing and being able to gaze at the vibrant stars by the warmth of a roaring fire is perhaps the biggest benefit. Posted in fire pits, outdoor fireplaces, outdoor living space, Uncategorized and tagged Fire Pit and Fireplace Maintenance Tips, FIREPLACES AND FIRE PITS on December 18, 2018 by Denise Bernstein. Most of us would not think winter as an optimal time to install a fire pit, however CST or EP Henry Segmental Fire Pit Kits can be easily installed on a crushed compact base any time of the year. Similarly, a custom designed fire pit can be installed when temperatures are above freezing. Posted in fire pits, landscaping tips on January 24, 2017 by Disabatino. Trees and shrubs suffer major stress during the dormant season of freezing temperatures, heavy snow, strong winds and ice storms. Believe it or not, during this time, water loss is the most common threat to plantings. The frozen ground doesn’t allow plants to draw up essential water, resulting in leaves being forced to sacrifice their stored moisture. In addition, these harsh conditions have the possibility to draw out even more moisture from the plant’s leaves, causing windburn, sunscald and even casualties. 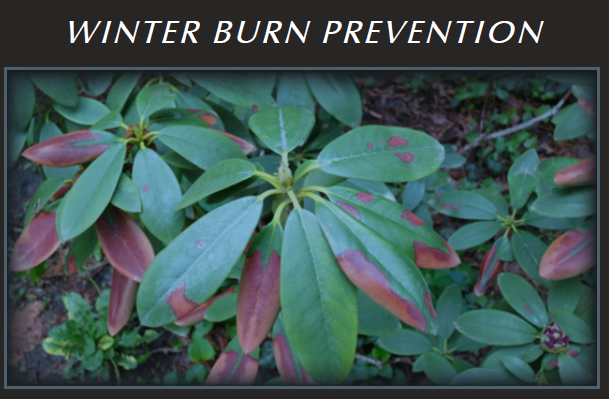 This mainly affects broad leaf evergreen shrubs such as rhododendrons, hollies, boxwoods, aucuba, camelia and certain laurels, especially newly transplanted and young trees. Posted in fire pits, landscaping tips and tagged landscaping tips on November 15, 2016 by Disabatino. Outdoor living is one of the most popular trends in home design. Many homeowners are extending the square footage with an inviting outdoor escape. And the options to choose from are endless. These hardscaped and landscaped combinations of patios, water features, outdoor kitchens, fire places and fire pits provide a perfect ambience the perfect environment for embracing nature and enjoying the outdoors. As family life has increasingly become a stressful time of rushing from one event to another, many are opting to make the most of their time spent together at home. Building an outdoor living spaces allows you to escape the stress of the day and enjoy nature without the distractions of television, phones and video games. An outdoor living area offers the opportunity to spend quality time talking and sharing stories with family and friends. There’s something very soothing about gathering around a nocturnal fire as the light fades and the stars appear. Make the investment in your home now and see the benefits it brings to your family. Posted in fire pits, landscaping tips on November 2, 2016 by Disabatino.